Have you ever heard about the Vinicunca, also called the Mountain of the 7 Colors? This natural attraction located in Cusco grows in popularity every day. Today, there is another similar attraction called the Mountain of the Seven Colors of Palccoyo. What to see in the Mountain of the Seven Colors of Palccoyo? Learn more about this new attraction in the Andes of Peru. Mountain of the Seven Colors of Palccoyo: what is it? Where is it? and how to get there? What is the Mountain of the Seven Colors of Palccoyo? What is the difference between the Vinicunca and the Mountain of the Seven Colors of Palccoyo? How high is the Mountain of the seven Colors of Palccoyo? How much does a tour to the Mountain of the Seven Colors of Palccoyo cost? How to visit the Mountain of the Seven Colors of Palccoyo without tour? What includes a tour to the Mountain of the Seven Colors of Palccoyo? What to take to a tour to Palccoyo? How is the weather on the Mountain of the Seven Colors of Palccoyo? What to see in the mountain? What is the admission schedule? When is the best time to visit the mountain? 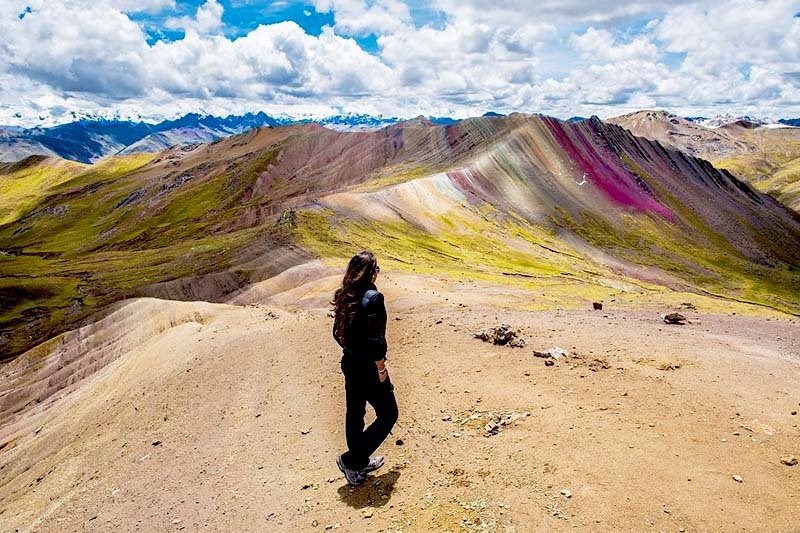 The Mountain of the Seven Colors of Palccoyo is a set of peaks dyed in colors similar to the Vinicunca (Rainbow Mountain), due to a process of mineralization during millions of years. The Mountain of the Seven Colors of Palccoyo is a great option if you do not feel fit for long walks but want to appreciate incredible landscapes. Unlike the Vinicunca, the Mountain of the Seven Colors of Palccoyo is a little known attraction and still with few visitors a day. The way to get there is much easier because it includes a walk of only 1 hour. From its top you can see the snowy Ausangate like nowhere else. In addition, there is a forest of stones and a unique landscape around. Attractions Mountain of the 7 Colors of Palccoyo. Mountain of the 7 Colors Vinicunca. End of the tour 6 pm. 6 pm. The Mountain of the Seven Colors of Palccoyo is located south of Cusco, a short distance from the snowy Ausangate, in the Andes Mountains of Peru. It is currently located in the district of Checacupe, province of Canchis. Palccoyo is located at 4,900 meters above sea level (msnm), 300 meters at a lower altitude than the Mountain of the 7 Colors Vinicunca (5,200 meters above sea level). Travel by bus from the city of Cusco to the town of Checacupe (2 hours). Travel from Checacupe to the town of Palccoyo. (30 minutes). Walk from the village of Palccoyo to the Mountain of the Seven Colors of Palccoyo (1 hour). The best way to get to the Mountain of the Seven Colors of Palccoyo is with a tour through a tourism agency. The most usual services are those that last 1 full day (full day) and can be hired in the Historical Center of Cusco. The tours include a 1 hour walk to the Mountain of the Seven Colors of Palccoyo. In addition, there are other tours that include direct transportation to Cerro Colorado. The tour to the Cerro Colorado of Palccoyo costs 70 dollars (USD) approximately. The price varies according to each travel agency and the quality of the service they provide. Visiting Cerro Colorado is also possible without a tour. To do this, you only have to travel on your own to the town of Checacupe. From there, tickets are acquired directly. The visit without a tour is without a tour guide. How much does the entrance ticket to the Mountain of the Seven Colors of Palccoyo cost? To visit Cerro Colorado on your own, you must purchase the entrance ticket in the town of Palccoyo. The cost for foreigners is 10 soles (3 dollars). National tourists pay 5 soles (2 dollars). Tourist transport from Cusco to Cerro Colorado and vice versa. Entrance to the Mountain of the Seven Colors of Palccoyo and the attractions around. Poncho for rain (in case it rains). The mountain of Palccoyo has a cold climate due to its proximity to the snowy Ausangate. The temperature may drop below 0 ° C. That is why, at certain times of the year, the slopes are covered with snow. What to see in the Palccoyo mountain? Besides being a natural attraction of incomparable beauty, the Mountain of the Seven Colors is a natural habitat for various types of animals such as llamas, alpacas, vizcachas, condors and more. On the road that connects Cerro Colorado there is a forest of stones formed naturally millions of years ago. From there you can appreciate the beauty of Ausangate, the largest in Cusco. Due to the cold weather, visits to the Mountain of the Seven Colors of Palccoyo are only in the mornings and part of the afternoons. The hours of operation are from 8 am to 3 pm. The best time to visit the Mountain of the Seven Colors of Palccoyo is during the dry season (April to October). In those months, rains occur much less frequently, making the trip easy. It is recommended to acclimatize to the climate of Cusco before visiting the Mountain of Palccoyo. Otherwise, the visitor may suffer the so-called altitude sickness. This mountain is a tourist attraction that receives few visitors every day. It is recommended to follow the indicated route and avoid looking for another different route. It is advised to find out how the weather in Palccoyo is located before booking a tour to the Mountain of the 7 Colors. The cold can cause the entire area to be covered in snow and the tour ruined. The trekking route to this mountain is not as challenging as the Vinicunca. That is why the Palccoyo is a great option for people who do not feel capable of making the difficult walk to the Mountain of the 7 Colors. ← Which countries in South America have a Machu Picchu ticket discount?